I have long believed that Bitcoin founder Satoshi Nakamoto was probably an NSA employee. I believe this not just because the hash codes and some key technology of Bitcoin, the first successful blockchain application, used crypto technology NSA developed. Not just because he or she or they had skills and information that may have come from NSA work. As NSA employee(s), they would have needed approval for outside work—and would likely not have received it, and gotten into trouble launching Bitcoin with its obvious uses in evading government spying. If Satoshi was simply shy or wanted to avoid drawing attention to future wealth, he/she/they probably would have gone public long ago. But violating the NSA rules and perhaps having improperly used some information, going public would mean possible prosecution and punishment. I’ve served in the federal government, as an intelligence officer, Federally Funded R&D Center (think tank) consultant, and in the Pentagon Senior Executive Service—these rules limiting outside employment are real and consequential. Following Occam’s razor, favor the simplest explanation: Satoshi was probably an NSA employee(s) who was breaking the rules by publishing and founding Bitcoin. He/she/they had to make up a fake name, and still need to remain anonymous. As a former intelligence officer and DoD think tank consultant, I’ve been to NSA at Fort Meade many times on projects, but never worked there full time and am not basing anything I write here on either classified or inside NSA information. This is all reasoned speculation. My second NSA related theory and prediction, is that the NSA will be tasked to take down Bitcoin. While relative to the Internet, blockchain is very secure and effectively unhackable for a criminal group—it is in fact quite capable of being cheated and manipulated if you have enough computing power. 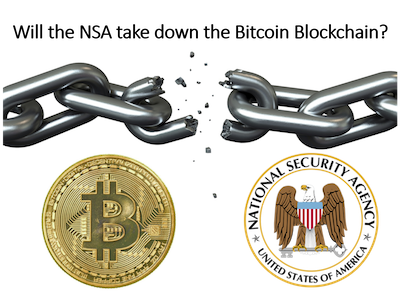 NSA probably has plenty of computing power and expertise to take the Bitcoin blockchain down. North Korea is a major owner, user, exploiter (for computer ransomware) of Bitcoin. As a sanction, punishment, or means of waging war, NSA could be ordered to rob accounts suspected of being NK owned. Bitcoin and many of its owners and advocates are Libertarian and anti-government. Bitcoin is an affront to national “fiat” currencies and handy for evading government rules and taxes. Big Government is very motivated to destroy Bitcoin. Bitcoin has been used as ransom payments for computer hacking. I predict it will soon be used for human ransom as well. Rather than the high risk of transferring dollars, kidnappers may demand digital payment in Bitcoin. This could be a motivation, or excuse, for Big Government to take Bitcoin down. China or Russia also have the computing power to take down Bitcoin, and may want to do so. Why? China has outlawed Bitcoin, may want to take North Korea’s wealth down a peg (keeping them more dependent on China), and could make a huge profit doing this. The government or large hacker network that takes it down does not necessarily have to profit from the attack—they may have other motivations and rewards than acquiring Bitcoin, which may be worthless post attack. Far fetched scenarios? Odds of one of these occurring may be slim—but there are many paths to war, many situations that could lead a nation state or a huge hacker group with lots of computing power and motivation to go after Bitcoin. For example, I believe a North Korean bio attack on the U.S. is likely. Bioengineering enables you to modify a virus like Avian Flu to make it human to human transmissible. Many experts believe that bioattacks are inevitable—and ideal for a nation state like North Korea or Iran to devastate the U.S. while leaving them unscathed since they are isolated and may develop a vaccine before they release it in the U.S. We may not be able to prove North Korea released the virus, or lack support for a nuclear attack to retaliate against North Korea, but a Bitcoin attack to rob North Korea would be an easy retaliation. China may want to take Bitcoin down to clear the field for a digital currency version of their Renminbi. They are studying and experimenting with this now. Russian Federation hackers may want to short Bitcoin on the Futures Market and then take it down. While the identity of Satsohi and NSA motivations to attack Bitcoin may be just entertainment, the fact that the Bitcoin Blockchain is not invulnerable is extremely important. Bitcoin did not evolve into a digital currency as much as “digital gold.” It has become a highly speculative investment and store of value. And it could be destroyed overnight by a large computer attack that transfers and robs Bitcoin accounts, and leaves a system that may not be able to recover, or may resume operations just to see panicked selling as scared speculators grab any remaining Bitcoin value and run. To the risks of investment in Bitcoin you must add the possibility that the Bitcoin blockchain can in fact be hacked, disrupted or destroyed, leading to an immediate large or total loss of value. A video that explains blockchain, cryptocurrency, Initial Coin Offerings, and Bitcoin’s status as digital gold is available here.